Frontline/World Reporter Mariana van Zeller: How did the lives of the Cinta Larga change after the contact with the white man? 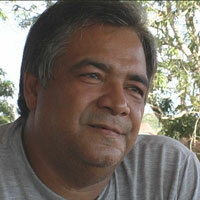 Izanoel Sodre: Every time an outside element comes into an indigenous community, that element causes a cultural loss. It brings new values that interrupt the social organizations circle. And which group do you think brought about that change in the most harmful way? For sure, the loggers, the miners and the missionaries. Loggers and miners brought with them an addiction to consuming, and the Cinta Larga society wasnt organized for the consumption that came with the logging and mining resources. But perhaps the mining situation lasted longer. The logging was brief and quickly combated by the Brazilian government. The mining has been slow to be combated, so I think it has been much worse. There was a time in which there were more white men than Indians on the Cinta Largas lands. So all the vices of the white society were passed on to the Indians. Such as alcoholism, then prostitution. But the one I think is the worst of all vices is consumption -- the desire to consume and the ease with which they can acquire those objects of consumption. The Cinta Larga are ashamed of going to the city now because they are considered outsiders, lazy, dangerous murderers, but if you spend time with them the way I do, Im sure youll see they are none of that. All those flaws that are attributed to them were brought here by the non-Indian society. For the mine to be legalized, the Cinta Larga will have to expressly authorize it. Do you think they will? If it depended on me, they wouldnt. But like in any other society, there are many different views among the Cinta Larga. Some still think the mine is their salvation, but Im sure the majority today longs for an alternative that will substitute for the mine and maintain their living standards. With this in mind, I think that if the mine is legalized, probably some villages will authorize it while others will be against it. Isnt it going to be almost impossible not to legalize the mine, considering its riches? Im sure I wont reach my goal of halting the mining activity. I said that if it depended on me, it wouldnt exist. But I know it doesnt depend on me, it depends on the political will of a whole country and probably a whole world economy. So, I know [my goal] really is utopia. But if the mining activity restarts, Id like the Indians to already have some knowledge of what gains and losses that activity brings to them. For example, for them to be part of the capitalist society, they have to know what is a profit, an expense, an interest rate, a share, a dividend, and they have no idea at all of any of this. So if the mining activity is to be reintroduced in the Cinta Larga lands, Id like the Brazilian government to worry about preparing those Indians so that they can control that activity themselves or at least have some knowledge of it. Coincidently, the majority of Brazils precious resources are found on indigenous lands. The biggest reserve of potable water in Brazil is in the Guarani land; the biggest reserve of cassiterite is on the Uru-eu-wau-wau lands; the biggest reserve of gold is in the Yanomami lands. So if the mining activities inside the Roosevelt indigenous lands are legalized, this for sure will irreversibly open the door for other reserves to be affected. Its bad. Thats why I hope it wont be legalized, but its only hope. I believe that the worst thing that can happen to a people is the loss of their identity, the loss of their culture. And you can be absolutely sure that the legalization of this mine will bring, even if slowly, the loss of the Cinta Largas cultural identity for sure. Do you think the Cinta Larga are also concerned about maintaining their cultural identity? All people are proud of being who they are. I think the Cinta Larga are the same. The president of the FUNAI said at the time of the massacre that the Cinta Larga were only defending their lands. Do you agree with this? Of course, and I go even further. I asked a Cinta Larga about the massacre and this is what he said: If you pass close to a beehive, the bees wont do anything to you, but if you try to take something from inside it, they will attack you. The same happened to the Indians. They were attacked, and they defended themselves. But how were they attacked? In the loss of their territory, in the invasion of their territory. Should the Indians have the same rights and duties as any other Brazilian? In Europe, for example, you have the Portuguese people, the Spanish people, the French, the English, the Scottish, etc., and they all form the European Union, but they all have their own sovereignty. And they all have their own set of laws. Why should we deny that to the Indians? They are also a distinct people with their own culture, and the law should demand respect for that distinction. Many people say that because the Indians have satellite dishes, cars, televisions, they shouldnt be treated differently from the white man. Do you agree? People say that because of ignorance. They are people who dont know the indigenous culture, they dont know this society well enough. It is true that some Indians, induced by white men, gained consuming habits that only brought disadvantages. Those objects that come from the white mans society unduly reinforce some Indian leaderships. There are Indian leaders who believe that by having a direct contact with the white society, they can maintain their status quo, maintain their leadership. They believe that if they lead a life with higher [economic] standards, they can keep the others as subordinates. But all this is instigated by the non-Indian society and not natural to the Indians. Its the white men themselves that facilitate the Indians acquisition of satellite dishes, TVs, cars. Its all financed by people with no character and no knowledge of the purity of this society. Are the Indians still very curious about the white society? Yes. Its more than curiosity. They want to become part of that society. They think that they can do that by marrying a white woman, that its their entrance door to the other society, and that they will acquire those benefits that exist on the other side. But most of the times, the exact opposite happens. Because they are a matrilineal society, the white woman comes to live in the village and brings her family and then there is mixing of cultures, which isnt good for the Cinta Larga. The Cinta Larga are a peaceful people. Ive worked with 46 different ethnicities, and I think the Cinta Larga are one of the most docile of them all. However, people say they are dangerous, killers, murderers, only because they wouldnt accept anyone to come into their territory without their permission. In 40 years it is impossible for one culture to understand the complexities of another culture that took 1,000 years to get where they are. The indigenous society arrived in the Information Age, and the surrounding society insists that they should have the same knowledge. Until 1988, the government decided for the Indians. In 1988, the government gave the Indians the right to decide for themselves. But the Indians arent always prepared to make a decision, and thats where the controversy lies. Im not sure if the Cinta Larga are prepared to decide if the mine is good or bad for them.